"A must-read for anyone interested in incorporating meditation into their lifestyle." Heartfulness is an ideal, a spiritual way of living by and from the heart that is inclusive of all ideologies, beliefs, and religions. In this heart-centered book, a student in conversation with his teacher, Kamlesh D. Patel--affectionately known as Daaji, the fourth and current spiritual guide of the century-old Heartfulness tradition--present a unique method of meditation with the power to facilitate an immediate, tangible spiritual experience, irrespective of a person's faith. Our modern, fast-paced world can be an overwhelming place. Every day, we're bombarded with messages telling us that in order to be happy, fulfilled, and worthy, we must be better, do more, and accumulate as much material wealth as possible. Most of us move through our busy lives with our minds full of these ideas, multitasking as we strive to navigate the responsibilities and expectations we must meet just to make it through the day. But what if there is another way? What if, rather than letting the busyness of life overtake our minds, we learn to be heartful instead? Based on Daaji's own combination of approaches and practices for the modern seeker--which draws from the teachings of Sahaj Marg, meaning "Natural Path"--Heartfulness is a contemporized version of the ancient Indian practice of Raja Yoga, a tradition that enables the practitioner to realize the higher Self within. While many books describe refined states of being, The Heartfulness Way goes further, providing a pragmatic course to experience those states for oneself, which, per the book's guiding principle, is "greater than knowledge." Heartfulness meditation consists of four elements--relaxation, meditation, cleaning, and prayer--and illuminates the ancient, defining feature of yogic transmission (or pranahuti), the utilization of divine energy for spiritual growth and transformation. 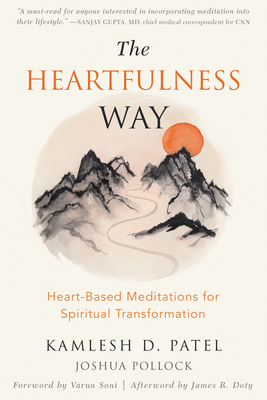 Using the method, detailed practices, tips, and practical philosophy offered in this book, you'll reach new levels of attainment and learn to live a life more deeply connected to the values of the Heartfulness way--with acceptance, humility, compassion, empathy, and love. Kamlesh D. Patel, known widely as Daaji, is the fourth and current spiritual guide of the global Heartfulness movement. His teachings arise from his personal experience on the path of Heartfulness, while reflecting his deep spirit of inquiry and respect for the world's great spiritual traditions and scientific advancements. Daaji practiced pharmacy in New York City, NY, for over three decades before being named the successor in a century-old lineage of spiritual masters. Fulfilling the many duties of a modern-day guru, he travels widely, extending his support to spiritual seekers everywhere. A self-professed student of spirituality, he devotes much of his time and energy to research in the field of consciousness and spirituality, approaching the subject with scientific methodology--a practical approach that stems from his own experience and mastery in the field.Joshua Pollock is a Heartfulness trainer and practitioner from the United States. An accomplished classical violinist, he has performed and taught throughout the world, including multiple collaborations with film composer A. R. Rahman. Pollock is a dedicated spiritual aspirant, and is enthusiastic about sharing his passion for meditation, frequently lecturing at private seminars; holding practical demonstrations in corporate, educational, and governmental settings; and providing ongoing individual support to local seekers. Pollock holds a bachelor of musical arts degree from Indiana University, and two master's degrees from Guildhall School of Music and Drama in London, UK. He currently resides in India with his wife and their two children. Foreword writer Varun Soni, PhD, is dean of religious life at the University of Southern California, where he also serves as vice provost for Campus Wellness and Crisis Intervention, adjunct professor of religion, and Annenberg Fellow of public diplomacy. He holds degrees in religion from Tufts University; Harvard University; the University of California, Santa Barbara; and the University of Cape Town; as well as a law degree from the University of California, Los Angeles. Afterword writer James R. Doty, MD, is professor of neurosurgery at Stanford University School of Medicine, and founder and director of The Center for Compassion and Altruism Research and Explanation (CCARE). Doty is author of Into the Magic Shop, and editor of The Oxford Handbook of Compassion Science.